2. Will die in prison. 3. Knew that Podesta’s e-mails were coming out beforehand. Jerome Corsi is a conspiracy theorist who helped advance the racist birther nonsense around Barack Obama’s birth certificate. He is not a credible source, so don’t take what he’s saying at complete face value. However, what he’s saying seems to be an admission of guilt. He lied to congress, and knew, somehow without Wikileaks’ help (despite the fact that Robert Mueller has documents showing that Roger Stone pushed Corsi to get information from Wikileaks) that John Podesta would be the topic of the newest Wikileaks e-mail dump. This interview is stunning in both its brazenness and its endless contradictions. "The first day, the statement I gave was wrong"
"I told Roger Stone" that "I thought it was Podesta's emails"
"My attorneys and President Trump's attorneys are communicating as if" there is a joint defense agreement but "there's nothing in writing"
It’s hard to make heads or tails of this bizarre interview. Corsi has advanced an incredibly implausible theory—that he anticipated Podesta’s “time in the barrel” on his own without any other help—and even if that was the case, it doesn’t make a whole lot of sense to try to advance this theory in the public light (other than to push a talking point to the group of people who will literally believe anything in slavish devotion to Dear Leader Trump). The thing to keep in mind while trying to follow the logic inherent in this massive conspiracy is that this conspiracy is driven by wholly illogical people. 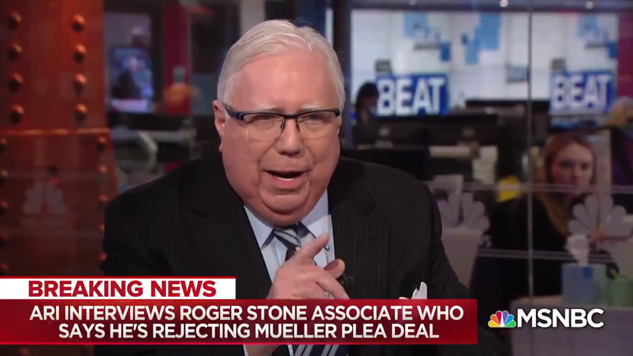 Jerome Corsi is not a savvy man, and neither is Roger Stone, let alone the president they both work for. Sometimes abject stupidity is the simplest explanation for inexplicable events.